Who ever heard of luggage with a cooler. Here's your chance to learn more and enter to win. Three winners. US only. Ends 1/12. Good luck. Their choice of Obersee Kids Luggage with Integrated Cooler! A $240 TRV Giveaway! 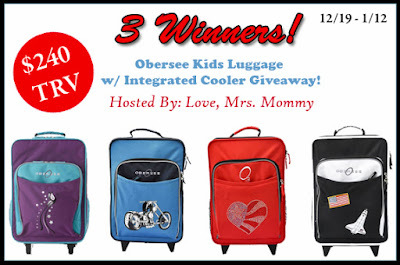 The Obersee Kids Luggage / Suitcase boasts a blend of creativity, functionality and style. All kids luggage features a main compartment for clothing, toys and other travel items. Additionally, the inner compartment features clothing straps and a pocket large enough for books. The outside of the suitcase features two drink pockets, additional outer pocket for easy storage, a carrying handle, quality wheels, and a sturdy pull bar for easy transport. Best of all, the front pocket is an insulated snack cooler for toting snacks while traveling. Measurements: 16" tall x 11" wide x 8.5" deep (40 x 28 x 22 cm); Suitable for use as carry-on baggage; Durable construction; Additional front pocket (on front of cooler pocket) for quick and easy storage; Ages 3+; Meets or exceeds applicable CPSIA & FDA standards.